1. To make the enchilada sauce, simply combine all the ingredients in a bowl and blend with a stick blender until smooth (this can also be done in a regular blender/food processor). 2. Pre-heat the oven to 180oc. 3. In a large frying pan, fry the onions and peppers until soft and golden brown then add the garlic and enchilada spice and season to taste. 4. 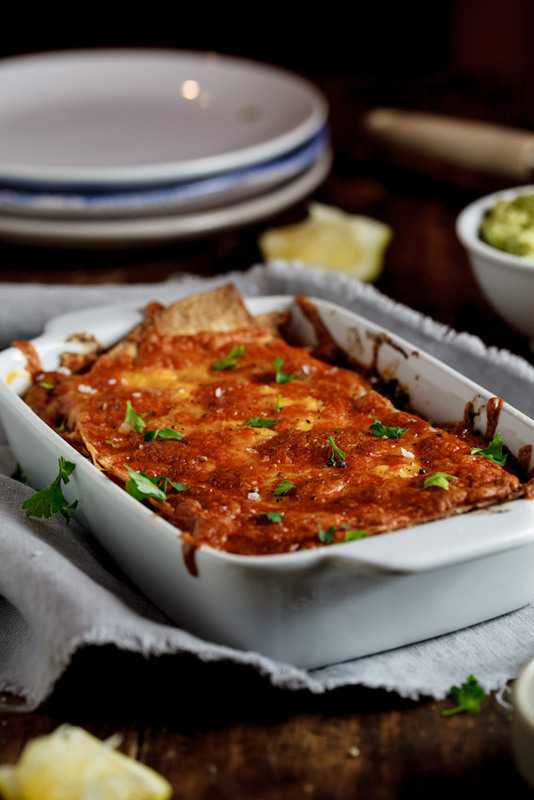 To make the enchilada casserole, lay 2 flour tortillas in a casserole dish then top with some of the pepper mixture, beans, corn and enchilada sauce. Continue until all the ingredients have been used. 5. Top with grated cheese then place in the oven. 6. Allow to bake for 20 minutes until golden brown and bubbling. 7. Remove from the oven and allow to rest for 5-10 minutes then serve with the guacamole, sour cream and pico de gallo. Alida Ryder is one of my favourite food people. Excellent cook, recipe developer, great photographer. Her website has a huge following and she is doing things she could only have dreamed of a few years ago. She’s written two books Simple & Delicious and Cook from the heart. Click here to go to her website.